Please click on the sub-menu items (on left) to learn more about our programs. Marie and Kevin are two players that call ACTC home. They are students in Andres Marco's Hi-Performance Junior Program. Marie tells me that she has trained at many clubs across Toronto but for her, "ACTC is my home training court" and Andres Marco is the best coach in Canada". Maria Patrascu is currently ranked #14 in Canada and #1070 WTA, Maria won the singles and doubles championship in the $10,000 106th Alberta Open. Kevin Portmann made the doubles final in the same tournament. Kevin is ranked #249 in Italy and #132 in Canada. The picture below was taken after Andres donated 2 hours of coaching to the ACTC 55 Plus team as they prepare for the ICTA 55 Plus Championship at the Aviva Tennis Centre at York University. What a plus it is to have players like Maria and Kevin at ACTC and a world class professional in Andres Marco coaching our Hi-Performance Junior Program. Our local High School, Maximilian Kolbe Catholic School has requested court time this fall so their students could be introduced to tennis. Two of our courts are often empty in the afternoon so we agreed to allow students to play during program time on the condition that if members arrive they may need to move to other community courts in the area. ACTC no longer provides children's tennis programs. 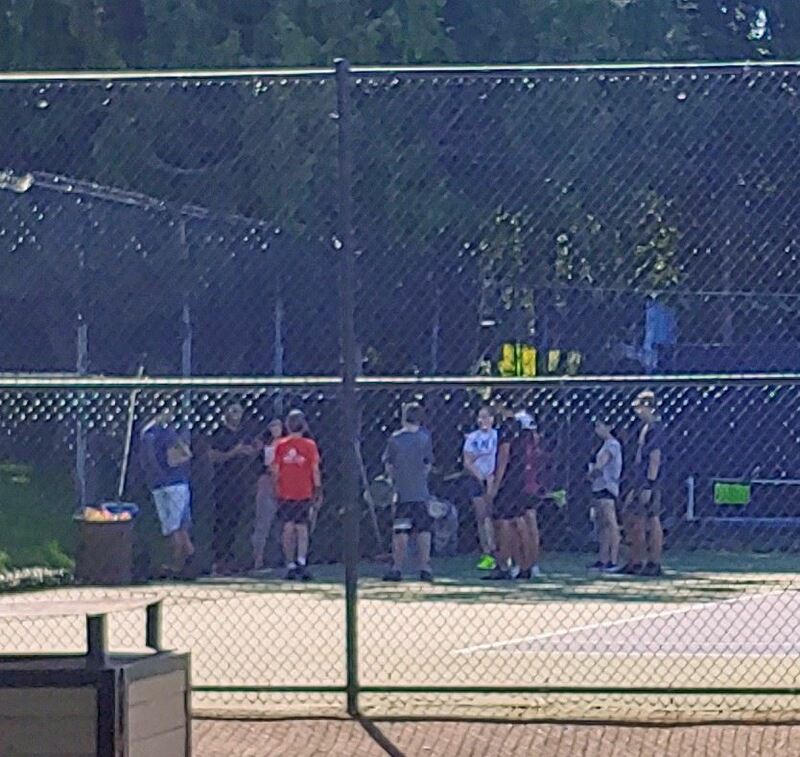 We stopped our summer children's tennis program because the Newmarket Tennis Club, the Marilyn Redvers Tennis Center and the Town's Fleury Park children's tennis program are meeting the needs of the community for introductory tennis. We are pleased that at ACTC we continue to support introductory tennis opportunities for young people. . The Ontario Human Rights Tribunal has ruled against the Inter County Tennis Association in respect to the number of women allowed to play matches on the Mixed Teams. The ACTC Board delegated a representative to the August 1st meeting of the ICTA. She has reported that members voted to file a request for reconsideration and an appeal to the Tribunal's decision by a margin of 50-12. There was a further vote to retain the same legal council as had handled the original case. Please read the ICTA background information presented below. The full decision of the Ontario Human Rights Tribunal can be viewed on our website here. The ACTC Board will be sending out a survey to all members to indicate our club's collective view. Please note, a survey is not a referendum - the Board of Directors will make the final decision on this matter after consultation with membership and other ICTA member clubs. The Intercounty Tennis Association reminds you of its special meeting of the Members, to be held on Wednesday, August 1, 2018 at North York Civic Centre, Memorial Hall, Burgundy Room B - 5110 Yonge Street, Toronto, at 6:30pm. Parking is available underground and at a nearby Green P. This location is TTC/Subway accessible. The purpose of the meeting is to review the Decision of the Human Rights Tribunal in the matter of Miller et al. vs. Intercounty Tennis Association. A link to that decision can be found here. File a Request for Reconsideration/Appeal. Retain the incumbent law firm of Ross & McBride to represent the Association in connection with any Reconsideration/Appeal. Only ICTA authorized club representatives or proxies can participate in the meeting. This decision will affect the future of the Mixed League and all players within it. It is important that we hear as many voices as possible on the direction you wish the ICTA Executive to proceed on this matter. Please talk about the decision with your club’s executive to ensure that your Club Representative attends and represents your club’s position. Club Representatives can send a proxy to the meeting. The designate must be given authority in advance of the meeting to act as a club rep on behalf of the club and the designate must be attending the meeting. Any Club Representative can only hold one proxy (2 votes total). The proxy can be directive, which means you can indicate which way the proxy is to vote for your club. The ICTA is sending out the following information to help inform its members when deciding which way to vote. What is the Reconsideration / Appeal Process? Reconsideration is the first step in the appeal process. A party sends the decision back to the ruling Vice Chair and asks them to reconsider the decision based on an error in law or a misunderstanding of the prevailing law. In our case, the Vice Chair (Pickel) resigned from the HRTO at the end of June and so reconsideration would go to another Vice Chair within the HRTO to review. This is a mandatory step prior to Appealing the decision. This application must be filed by August 12. The ICTA currently have their lawyers working on this under the assumption that a) the membership will choose to move ahead and b) that there is no cost involved. A reconsideration can be abandoned at any time. Our legal team will find the necessary grounds on which to file this application. This process will take about 3 months. A Judicial Review (JR) is what they call the appeal process within the HRTO. This process is longer and more complicated than Reconsideration. The JR is heard in front of 3 Superior Court judges who would decide the case. They are charged with deciding if there were any errors of interpretation in the evidence that was presented. The ICTA can be joined by other groups called ‘Intervenors’ to bolster our position. (Intervenors are organizations that will be affected by this decision (this decision could affect all sports leagues in Canada that offer mixed gender formats)). The JR process does not come with an automatic ‘stay’ in the decision. It would have to be approved by the panel of judges, but it is viewed likely that this motion would pass. This would mean that the decision, if upheld, would be deferred by a year given the time that this process takes. This process would take between 6 and 9 months after Reconsideration. There are several areas that we (ICTA and Legal) disagree with Vice Chair’s decision. We believe that the Vice Chair, in her decision, was very generous in her assessment on the harm done to the 3 applicants. The applicants needed to prove that they were negatively affected by the current format of the league. We don’t believe that the applicants met the threshold required. The Vice Chair decided that the focus of the case should only be the ICTA Mixed League. A broader interpretation of the question would have shown that within the ICTA’s offerings there are many more playing opportunities for women than men. All the evidence indicating that the current ICTA Mixed league format meets the actual demand for competitive play at a club level in Toronto, Ontario and nationwide didn’t weigh very heavily (or at all) in the Vice Chair’s decision. The Vice Chair believed that there were sufficient numbers of strong female tennis players interested in playing in the mixed league that are not currently playing. Our presented evidence does not support this. There are other areas where the decision can be questioned. Building this case isn’t our current focus. It will be, if we receive approval from the membership to proceed with an appeal. What is the Financial Impact of Appealing? These are the fees for getting the proper documentation to the court. Our current lawyers have agreed to proceed through the JR at a low bono rate. It is possible that, should we lose the JR, that the applicants would be eligible to receive damages (but likely only if they get representation). Note: If we were to win, the applicants could be responsible to pay our legal costs and so they may choose not to defend against the JR. This doesn’t mean that we would win. It does mean that it would just be our voice at the hearing. The costs of the legal proceedings going forward will continue to be paid for by the ICTA. The ICTA does not intend to pass future legal costs to member clubs in the form of a one-time levy or ask member clubs to ‘foot the bill’ by contributing additional funds beyond the annual team/club fees. What is the impact of this decision on the Mixed League? If this decision were to remain in place, there would be great change within the ICTA and within the Mixed League in particular. The decision indicates that the Mixed League would need to be gender equal but leaves the format of any change to the ICTA to implement. Our records show that many more of our defaulted matches are already caused by a lack of women available to play. That fewer clubs in the Mixed League would increase travel time and could lead to more teams leaving. That the competitive balance would shift to men currently in higher levels playing against women currently playing in lower levels. That fewer teams in the Mixed League will lead to decreased revenue for the ICTA. That clubs that rely on teams to fuel membership might lose members. There has been some conjecture, that should this decision stand, that the ICTA would instantly start a Men’s League. This is not something that the ICTA has seriously contemplated at this time. Thank you for taking the time to read this information. Results of the vote will be posted on the ICTA website following the meeting on Wednesday August 1. Pickleball is a fun sport that combines elements of tennis, badminton and ping-pong. It’s a game for all skill levels and ages. For young people, pickleball can be a great way to introduce young people to tennis. Hand eye coordination, learning how to improve your skills and playing with different partners are great experiences for young and old alike. The burgeoning community of pickleball players in Aurora will be able to enjoy matches in a scenic surrounding at McMahon Park. 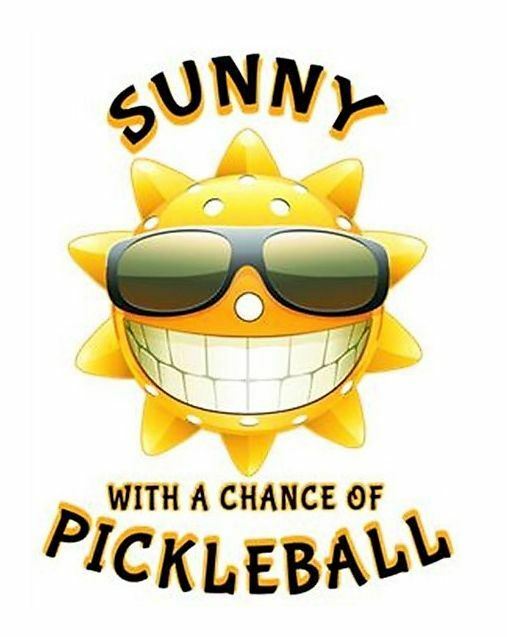 They will have access to our clubhouse facilities and enjoy relaxing social times with other Pickleball players. Playing on our cushioned courts will reduce the possibility of injury. Currently outdoor Pickleball is played on hard asphalt courts which often contribute to injuries. At the ACTC McMahon Park there is court side parking, clean and wheelchair accessible washrooms and wind protected courts. Also, our pickleball program provides paddle bats, instruction and equipment storage.